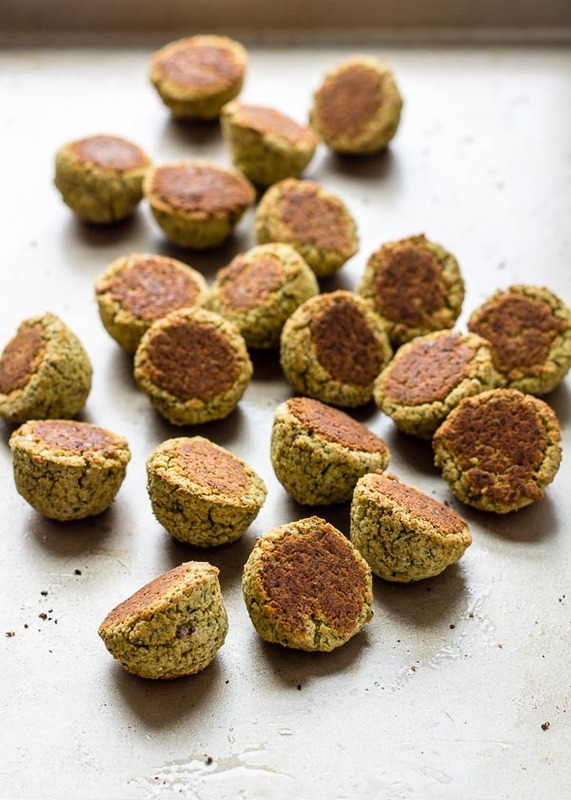 Halfway through baking these, moments after I opened the oven door to flip the little falafel balls belly up, letting out a hot garlicky waft, there was a knock on my door. Locked out roommate? I thought. But it was a stranger, standing quite a few steps back from the doorway, probably so as not to scare me. “Hi, I live up on the third floor. It smelled so good down here I had to know what you were cooking.” So he had sniffed his way down here. And then, before I could say more than “Oh! I’m making falafel,” he promptly ran away. I wanted to offer him some, but I didn’t even get his name. I checked the mailboxes downstairs but couldn’t figure it out. There is more than one apartment upstairs, and one of them has an intimidating Asian girl with a perpetual scowl who I am afraid of, so I am not about to go knocking on doors. These are amply spiced and herbed, but not too much so. I’m practicing restraint with my cupboard of 40+ spice jars. There are 3 jars of paprika and 4 of cinnamon. Why?? One day they will topple on my head (the shelf is high up) and I will most likely die of sneezing. Did I mention the 5 different jars of chili powder? I’ve also been moving away from McCormick and buying from spice stores and Indian markets. Their spices are far more potent, so I need less. But spice as you see fit and think of my measurements as rough guidelines. 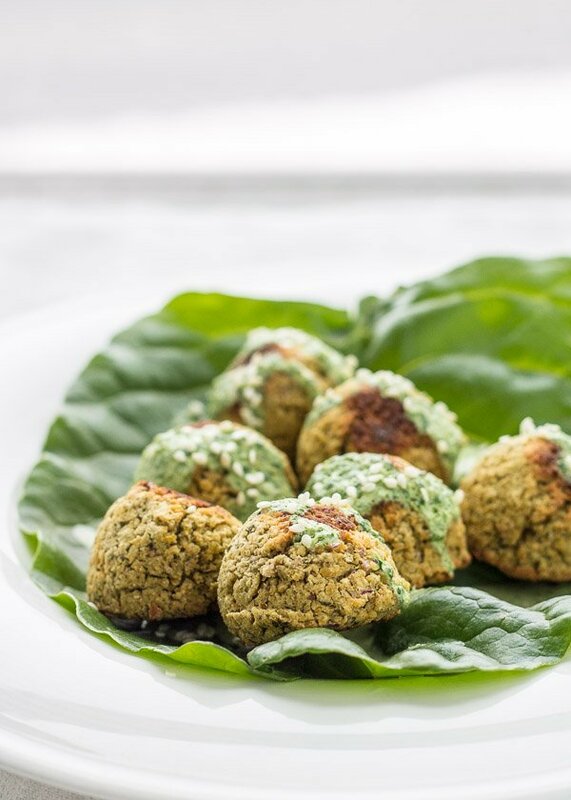 I do not pretend to be a falafel expert, but I’ve had my fair share of good falafel when I was vegetarian and living in NYC, though the best I ever had was at Oleana in Cambridge. 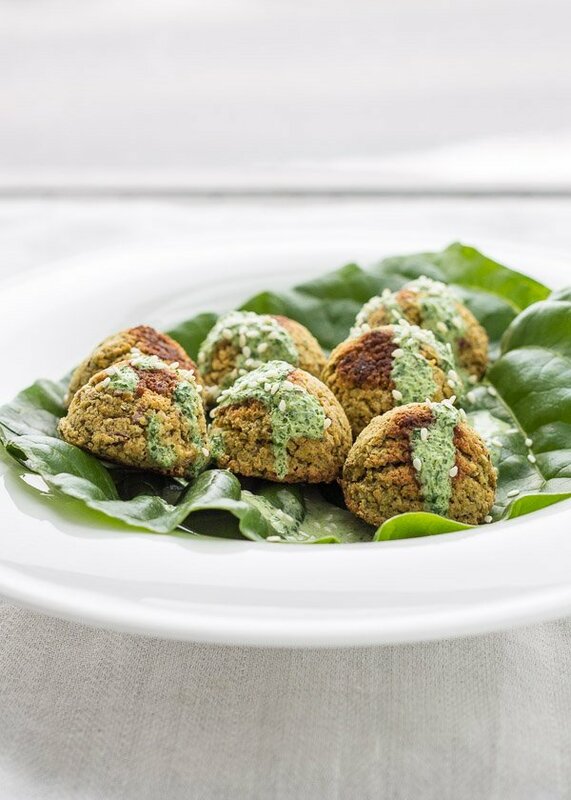 I like my falafel crispy on the outside, fluffy on the inside, fresh, and spiced. I also admit that it tastes better when it’s deep fried, but I cannot go through that ordeal again. My kitchen was filled with cumin scented fog for days. 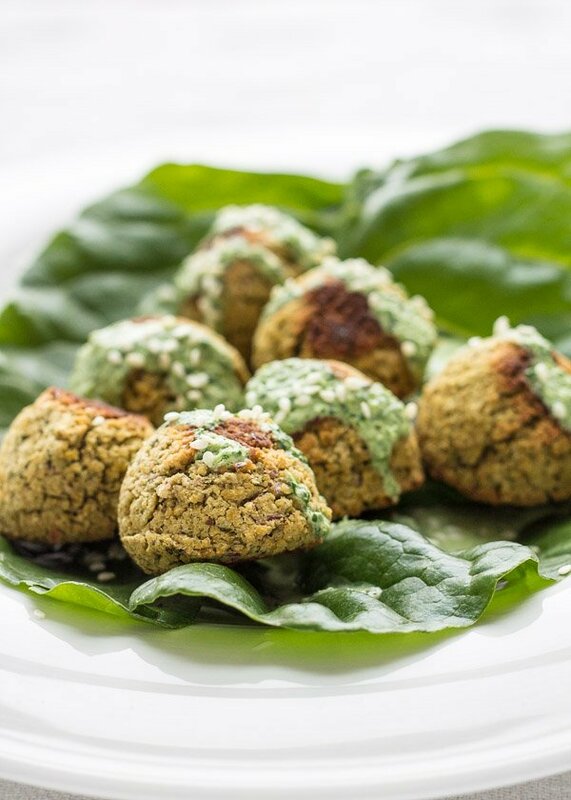 I sprayed these baked falafel generously with my oil spritzer, left out the flour, and baked them instead. They are still immensely flavorful, healthier, and suitable for indoor cooking. Plus they come out hot and crispy all together. The original recipe calls for parsley, a bit of flour, and deep frying. I left out the parsley because I hate parsley, but you can use it if you don't share my hatred. I left out the flour because its purpose is to bind the falafel mixture together when deep fried. I deep fried the first time I made these and that method is indeed delicious. But when baking, there's no need to add the flour. It only serves to dry out the falafel, which we don't want. I also like to cook my own chickpeas because I find that canned chickpeas are a little too mushy. If you start with dried chickpeas, cook them until they are still firm. I cooked mine in a rice cooker with 4 cups of water for 2 hours. If you give these a try, don't forget to tag it #supernummy! Place a rack in the upper third of your oven and preheat to 375° F. Generously grease a baking sheet with light olive oil. Put all falafel ingredients in a food processor and pulse, scraping the edges down, until the mixture is finely ground but not smooth. Use a 1 and 1/2 inch cookie scoop to measure out balls of the mixture into the palm of your hand. Gently press the sides to firm up the balls, then place them flat side down on the baking sheet. Spray generously with more olive oil. I used a Misto. If you don't have a spritzer, drizzle with a spoon. 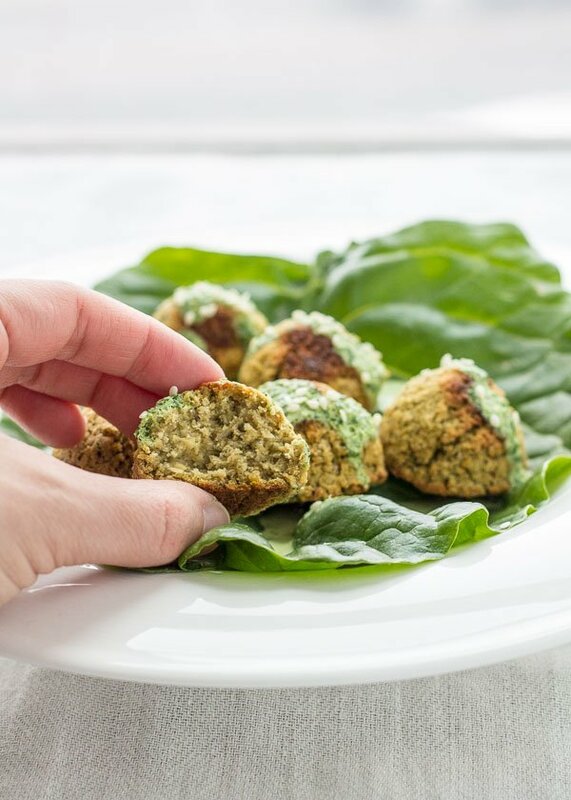 Bake for 10 minutes, take the baking sheet out and flip each falafel ball, then bake for another 10 minutes. Roughly adapted from Olives, Lemons & Za'atar. Yum! 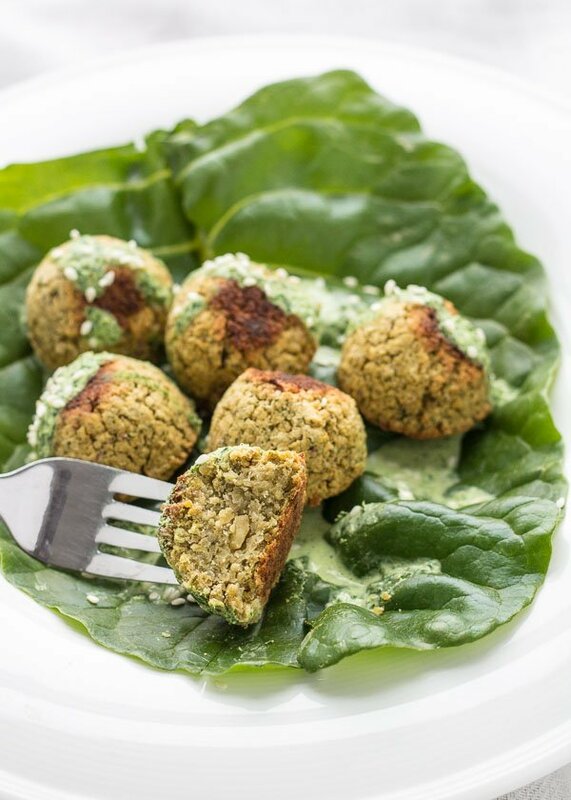 Love baked falafel and this looks amazing. Thanks Alison! Love your blog name btw!